Siemens PLM put together a nice video showing the evolution of FEMAP over the last 30 years. It showcases some of the major projects that have been involved in FEMAP over the years. CFD and FEA services is our core business and has been for more than 20 years. 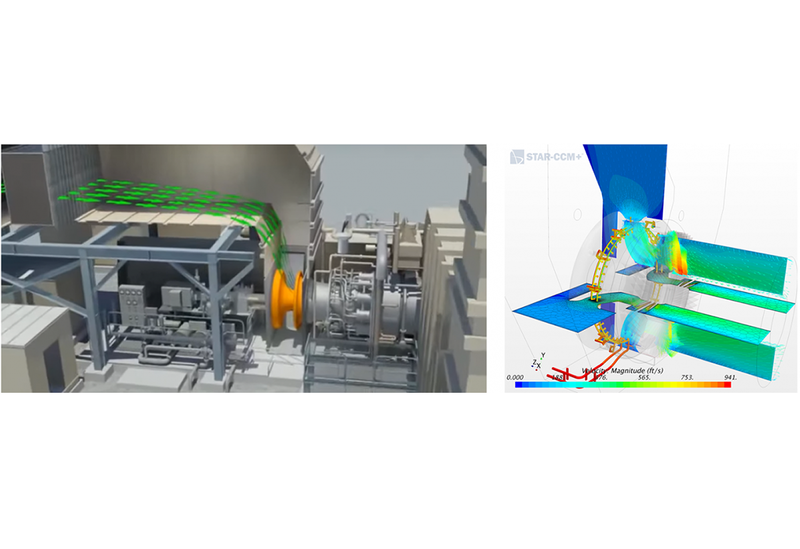 Recently we just completed a coupled computational fluid dynamics (CFD) and finite element analysis (FEA) project on a water injection system (wet compression device) to an existing gas turbine. The energy physics of this turbocharger is to spray water droplets into the inlet of the compressor side of the turbine thereby increasing the density of the already 100% saturated air. This heavy air mixture is then combusted with increased gas flow, yielding a 10% boost in energy output from the turbine. Most FEA work in the world is dominated by linear elastic stress and vibration analysis (implicit). The complexity varies tremendously within this realm and can be every bit as challenging as a highly nonlinear transient model (explicit). In the linear world, stress values are very sensitive to small changes in strain, and often take on even greater importance, since their values are used to verify the design margin of a structure or its fatigue life. Since the mission statements and analysis requirements between implicit and explicit analyses are different, one has to shift gears to move from one to the other. It is the focus of this short note to point out how a journeyman explicit simulation engineer can quickly and efficiently create implicit analyses from linear to nonlinear. Where do I really start?